The Annie Armstrong Circle meets the second Tuesday of each month at 12:30 p.m. at the church. In addition to participating in the church-wide WMU projects, we work on mission projects and other needs we learn about in our community. We prepare and serve dinner one night each winter when UBC hosts area homeless men for two weeks through PACEM. The Circle supports local nonprofits like Georgia’s Healing House and the Ronald McDonald House with needed donations from their wish lists. In December, members sponsored needy children at an area elementary school. We annually support a fifth grade class through the CBF (Cooperative Baptist Fellowship) Mission in Nada, Kentucky. Home Care members at UBC receive flowers, gifts, and cards at Christmas, birthdays, and other holidays from Annie Ladies. For more information, please contact Martha Ballenger, Membership. Kittie Colvin Trail Circle — During the school year we meet the first Tuesday of each month in members’ homes at 7:00 p.m, to work on WMU missions projects and other needs we learn about in our community. In addition to participating in the church-wide WMU ministries, we also sponsor a Christmas Post Office where church members can deliver their Christmas cards for other church members and donate the postage cost saved to Global Missions. We “adopt” a family through Albemarle County Schools and purchase clothing for the children at Christmas. We regularly take treats, individual serving heat-and-eat foods, and laundry supplies to the University of Virginia Hospitality House. We cook and serve dinner one night each winter when UBC hosts area homeless men for two weeks through PACEM. Through the CBF (Cooperative Baptist Fellowship) Mission in Nada, Kentucky, we sponsor a kindergarten class as well as a young mom who has taken in three nieces and nephews and who is returning to college. We provide gifts and cards to shut-ins at Christmas, their birthdays and other holidays. Each December we draw names for Secret Pals and do little treats, gifts and surprises for each other throughout the coming year. During the summer our meetings are held on Sunday evenings at area restaurants for a special girls-night-out. We are ages 30-60 plus and welcome you to join us. For more information contact Sarah Buchanan. We get together the 2nd and 4th Tuesdays of each month; join us either or both, in Room 120. 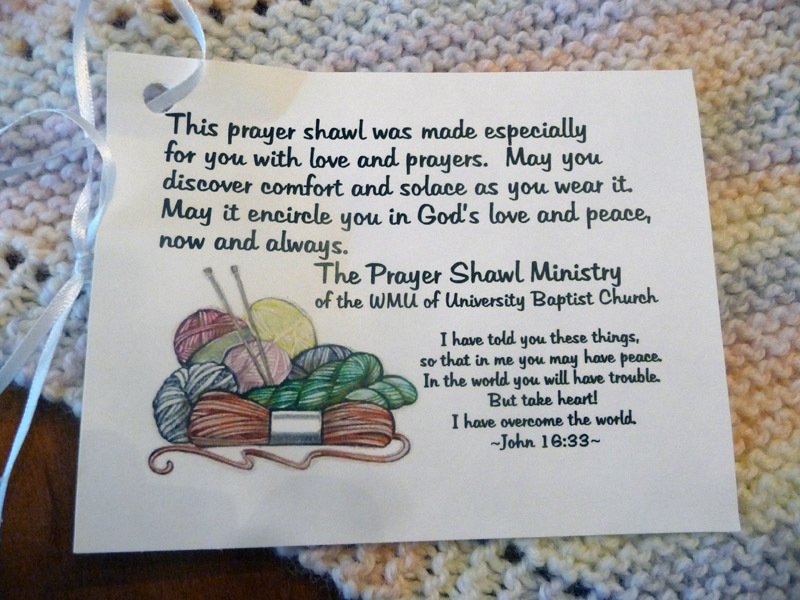 Join us to quilt, knit, and crochet prayer shawls or lap robes to be given to church members and friends who need to be comforted and reminded that the people of UBC care for them in a time of need. Bring your work materials with you or we have plenty to share. If you would like to be a part of this ministry of caring but can’t come to the meetings, we’d be glad to share materials and patterns so that you can create the shawls at home. If you would like to learn to quilt, knit or crochet come and join us. There is a collection box near the church office for donations of cotton quilt fabrics, batting and yarn. Cash donations are also welcome. For more information call Anne Keith or Sarah Buchanan. Toiletry Kits for FWCC — Also in time for Christmas, we collect shampoo, deodorant, lotion, tooth paste and tooth brushes to be given to the women prisoners. Collection boxes are near the Church Office and on the stage in the Fellowship Hall. School Supplies — Each fall we collect money and purchase school supplies for children at Woodbrook Elementary. These children all qualify for free or reduced lunch. In the fall of 2008 there were only 50 needy children at this school; by the fall of 2011 there were 154 (51%) students in need of assistance. State Missions Offering: Each September — Alma Hunt Offering for Virginia Missions is sponsored by the Virginia Baptist Mission Board. The Alma Hunt Offering for Virginia Missions supports numerous ministries throughout Virginia and the World. For more information go to almahunt.org. National Missions Emphasis: Easter Offering — Envelopes will be located in the pew racks. Contributions will be collected through the end of April. This offering is given to the CBF, for use within the United States, for rural poverty, HIV/AIDS, starting churches, and chaplaincy or pastoral counseling programs. For more information go to www.thefellowship.info/Missions/Ministries.